« Switchin’ It up again! 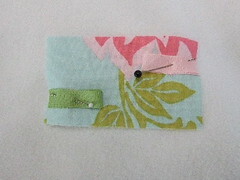 This entry was posted on August 20, 2008 at 12:45 pm and is filed under project, sewing, Tutorials. You can follow any responses to this entry through the RSS 2.0 feed. You can leave a response, or trackback from your own site. cute cute cute..I need to try that! What a great tute, thank you so much. these are neat. i want to do one for my great-niece for christmas. where would i find the wood rings? would drapery rings work? I’m trying to reach you to request permission to link to your tutorial (and share a photo) for our Handmade Holidays on the Sew,Mama,Sew! blog. I couldn’t find your contact information. Would you mind emailing so I can give you the details? We love your project and would like to share it with our readers. What a wonderful easy baby gift! Thanks. 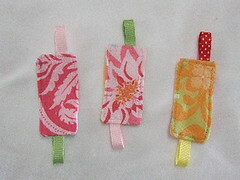 Thanks for sharing your great gift idea on Sew, Mama, Sew. 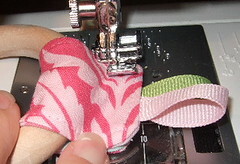 I’m still a novice at sewing and I’m not sure I know what fusible fleece interfacing is. I have the added disadvantage of living in Austria, so I can’t just go to a fabric store and ask about it. 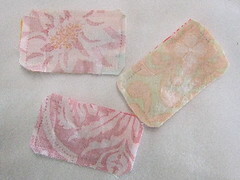 The place where I buy lining has two varieties — one is fairly stiff and I use it for lining bags or things that need a defined structure, and the other is very light-weight and adds a little weight, but not really much stability. Do you think either of these would work? If so, which do you recommend using? These are great! I am the nursery director at my church and am always looking for a little handmade gift I can add to baby shower presents! Okay, I’m sure I’m just being paranoid b/c no one else has been concerned about this–but have you ever found the recipients concerned that their child is gumming a wooden ring? I’d be worried about splinters… I don’t know, is this not an issue? Sorry, I feel like it’s a dumb question, but this is so cute and I’d love to make one for some friends–I’m just afraid they’d be worried. Hey Ann Marie… The rings I use are so finely sanded that there would be no way to get a splinter from them. *At least I dont see how it could be possible* Also I found that my daughter actually chews on the fabric parts more and just uses the ring to grasp it. Hi! 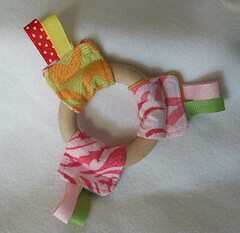 I love these and would like to make them, I just do not know where I could find the wooden rings. 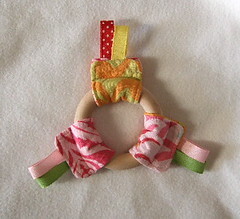 you can buy wood teething rings on etsy (see my above link). And they will NOT splinter or harm your child. think back before plastic was around, and i know it is hard to think of a life before plastic lol but children use to play with only wood toys. And think of how natural wood is vs. plastic. And we all know of the lead scare, and because most of our products come from China these days – we have no guarantee that the lead issue won’t come up again. So purchasing and using natural wood items and home made items are starting to make more sense to me these days. Im having trouble finding the wooden rings. I saw them on etsy but they were kind of expensive. anyone find them elsewhere? The wood is not covered because the wood rings I purchase are sanded to a smooth perfection. Unfinished wood is perfectly safe for babies to chew on. I am so featuring this cute toy! I cannot find rings anywhere, except curtain rings on Ebay. Anyone found them anywhere? This is fantastic and so simple! 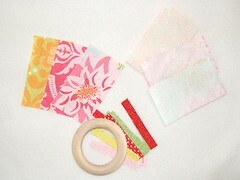 I loved it so much I put it on my Baby Craft Projects post to share with others. I will be giving it a try soon! Hello, I found your blog in a new directory of blogs. I don’t know how your blog came up, must have been a typo, Your blog looks good. Have a nice day. Fabulous I will be putting a link on my blog as I made a similar teether based on your idea, but with a broken sewing machine I had to compromise. Waw(?!) it’s really cute! But the bare wood looks a bit boring,no offensive! may have here on this post. I will probably be coming back to your blog for more soon. I love to disseminate knowledge that I’ve accumulated through the year to help improve team efficiency. with the 12 months to help improve team performance. Hello! I simply would like to give an enormous thumbs up for the good data you will have here on this post. the door. However, you can create smaller scrapbooks to give as gifts to the people who worked on your home Remodel Narrow Bathrooming and landscaping designs. Bathrooming and/or expanding the place where everyone gets together as family or friends. Thanks for furnishing such well put together posting. upsets me. Any website with content may give you a potential consumer. Among the best functions supplied by the toolbar. of us have developed some nice procedures and we are looking to swap solutions with others, be sure to shoot me an email if interested. this tppic here on your site.